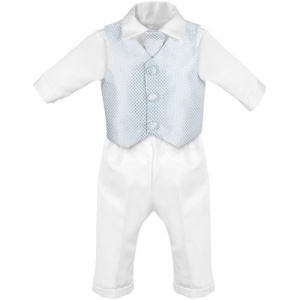 Baby boys white & blue check 4 piece satin suit, perfect outfit for any special occasion including a christening / baptism, wedding, formal occasions etc. Waistcoat: Satin effect waistcoat with a white & blue check pattern, fully lined, 3 centre buttons, plain back. Tie: Satin effect tie with knot with matching white & blue check pattern. Elasticated for the perfect fit, complimenting the suit perfectly. This white & blue check satin 4 piece outfit will make your little baby boy look like the perfect handsome gentleman at his christening / baptism, as a pageboy or a guest at a wedding. Fell in love with this suit before putting it on. Baby was so cute that made his dad have a tear. Highly recommend this suit for a little boys christening. Perfect with a white pair of shoes. 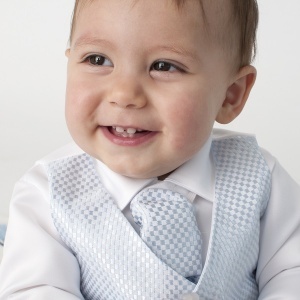 I was unsure if this suit would make our 23 month old too grown up for his Christening, but it was perfect, he looked very sweet and the suit looked smart and cute. We bought pale blue leather boot style shoes and the whole outfit looked awesome. Washed trousers and shirt very easily on 20C and 20 min wash, came up really well. Fab suit my some looks so handsome in it..
lovely outfit. can't wait to see my little boy wearing it on his special day. Arrived on Time. great serives would highly recommend web sight to friends and family.